You are here : Home >> Blog >> Removable Wallpaper: Is the Peel-and-Stick Option Right for You? Are you someone who loves wandering through the aisles of Home Depot on a weekend to find a new home improvement project? 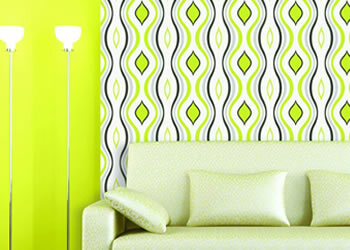 Has the wallpaper aisle caught your attention with promising proposition of removable wallpapers? Well, before you spend your hard-earned money on reams of removable wallpaper, allow us to give you all the information about the “renter’s wallpaper” or the “temporary wallpaper”. Is Removable Wallpaper Right for your Residence? 1. Is this your Home for a Long Time? Are you living in a college dorm that lacks color? Do you want to change the color of your rented apartment without receiving flak from the landlord? Specially made for those who want to avoid the landlord’s unnecessary questions, removable wallpaper is easy to install without any mess. You can use the wallpaper as a temporary decorative solution. It is useful if you love changing the look of your home or you move from one place to another frequently. You can even peel the wallpaper easily and reuse it when you move in to a different home. But, remember to save the non-stick backing so that you can use it to keep the adhesive intact while traveling. While choosing a costly removable wallpaper, remember that reusing it can be tricky because your new place must have walls that match the cutouts in the wallpaper. If not, there can be wastage of material. So, if you are on the move constantly and change home every couple of months, it is best to stick to cheaper removable wallpapers. There are many homeowners and renters with a strong opinion about wallpaper. But, do not disregard removable wallpapers as simple paper wall decals. Today, you can find temporary wallpapers made from natural fibers, polyester material, woven fabrics, etc. If you are not going to stay in your current home for a very long time and still want to add color to the walls, removable wallpaper can be an affordable option. The cost of painting a typical 10*12 feet room can range from $300-$800. If you are using an affordable removable wallpaper that costs around $50 per roll and the roll is sufficient for 56 sq. ft., you will at least need 1.6 rolls. It means you may have to spend $100 on the supplies. Now, the cost can increase depending on the area of the room, number of doors and windows, quality and style of wallpaper, etc. But, removable wallpaper definitely proves to be ideal for DIYers who love to experiment and add their personal sense of style on a budget. 3. Instant and Easy Gratification? In the times of fast food, right-swipe dates and online shopping, instant gratification is important. Painting may seem to be your preferred choice but when you are looking for quick home improvements, removable wallpaper can be your easy way out. Now that several companies have started offering removable wallpapers, you have many options to make a choice. If you are looking to spruce up the place for an upcoming party, a family get-together or a festival, removable wallpaper is your best bet. It can definitely add glamor to an otherwise dull wall. You can buy the peel-and-stick wallpaper options at your local home improvement store. Affordable styles are available at just $30 for a roll that covers 56 sq. ft of area. Easy to install and quick to remove, you cannot go wrong with it. Removing the temporary wallpaper doesn’t take more than a few minutes. It means you have a canvas waiting for you anytime you wish to make changes to your home’s ambience. Why hire a Professional Wallpaper Installer? You may argue that removable wallpapers simply require peeling off the backing and sticking it to the wall. Then, what is the need of a professional who will charge an hourly rate for wallpaper installation? Different wallpapers have different installation procedures. And, you need to know everything in detail before beginning the project. Now, if you are going to simply cover a small area with wallpaper, you can do it on your own. But, if the task is big, there are higher chances of mistakes. Avoid wastage of material and get things done the very first time with the help of a professional wallpaper installation company. Choosing a professional will help you to prep the walls quickly. If the drywall has cracks and holes in it, you will have to repair it and sand it lightly. Peeling paint may even need attention. And you may need to seal the surface properly for porous walls. It can only be possible with an expert at your beck and call. Are you interested in giving your home a new look? Whether is painting the interior of your home or installing wallpaper in a few rooms, choose Toronto’s reliable home painter. Perfect Painter offers the most comprehensive home painting and wallpaper installation service in GTA. Call now on (416) 477-1400 or enquire online today.